We stand behind our workmanship and materials with our warranty. 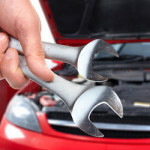 Please do not hesitate to contact us about any vehicle repair concerns. Our workmanship and parts are guaranteed for 12 months / 20,000 kilometers* (24 months / 40,000 kilometers for premium quality parts) with our Nationwide Warranty. The time and distance (e.g. 12 months / 20,000 km), whichever comes first, begins immediately following the performance of the service/repair operation, to the extent that we will replace faulty materials or render new services (as the case may be) but not exceeding the amount originally charged. Please call us before obtaining warranty service.